Advances in arthroscopic instrumentation and better patient selection have improved outcomes following arthroscopic rotator cuff repair in recent decades. The critical question guiding treatment is no longer whether a tear can be repaired, but whether repair of a torn rotator cuff will lead to a predictable outcome. This prediction is made largely upon biologic markers such as fatty infiltration and atrophy of the cuff musculature as well as patient age. Any tear that should be repaired can be repaired arthroscopically. Arthroscopy provides several advantages over the traditional open or mini-open techniques including improved visualization of large tears and less deltoid damage. The principles of cuff repair remain the same, regardless of the approach, with the goal being a tension-free, complete repair. 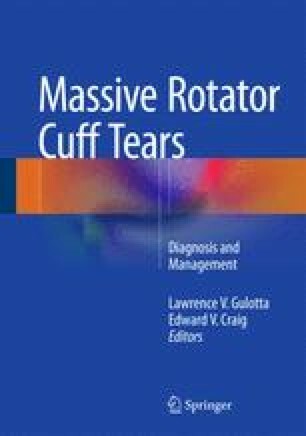 Releases done arthroscopically mimic those used in open surgery and are described in this chapter including arthroscopic release of a retracted subscapularis tendon. Arthroscopic debridement and biceps tenotomy is an option for lower-demand patients with large irreparable tears. Rehabilitation following arthroscopic rotator cuff repair should include a period of immobilization to allow early tendon healing. This does not result in intractable stiffness as was thought when repairs were done open.